A woman driving her car in the course of her employment was rear ended by another vehicle on the Massachusetts Turnpike while exiting. She incurred a herniated disc injury to her neck, requiring surgery and resulting in permanent scarring. 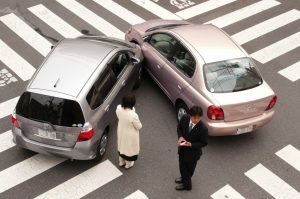 Under the law, if anyone is working at the time of a car accident, they have 2 claims: one is against the workers compensation insurance company because they were working at the time of the accident; and the second is against the car insurance company for the car that caused the accident. This means medical treatment for an injured worker is covered by the workers compensation company and can collect her lost wages while out of work from them, and she was compensated for her pain and suffering against the car insurance due to her injuries. Additionally, the Employee is pursuing her permanent loss of function and scarring against the workers’ compensation company. The full policy of $50,000.00 was offered by the car insurance company.